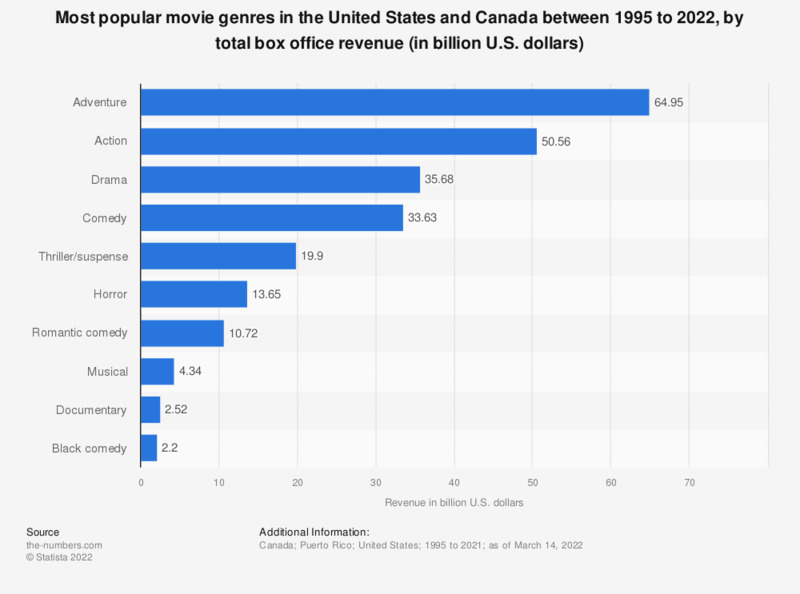 This statistic ranks the most popular movie genres in North America by box office revenue. Adventure ranked first, with a total box office revenue of 59.79 billion US dollars. Second in the ranking was the action genre, with a total box office revenue amounting to 44.61 billion dollars. Films within the drama, adventure, action and drama movie genres generated the most box office revenue in the years between 1995 and 2019. As of January 2019, none of the three most successful movies of all time (in terms of global box office revenue) were comedies. “Avatar” was the most successful movie, having raised 2.8 billion US dollars in box office revenue. “Titanic” came in second with 2.2 billion US dollars raised, and “Star Wars: The Force Awakens" ranked third with 2.1 billion raised. Dramas and comedies also topped the list of movie genres ranked by number of releases in North America from 1995 to 2018. Between 1995 and 2018, over 2.22 thousand comedies and over 4.95 thousand dramas were released. Box office revenue, the amount of money generated through movie ticket sales, remains one of the motion picture industry’s most important measures of a film’s commercial success. In 2018, over 1.3 billion tickets were sold in the United States and Canada at an average ticket price of 9.11 US dollars each.